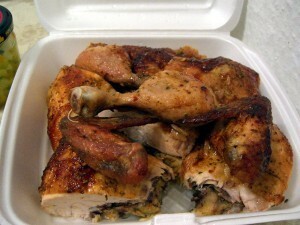 Broast Chicken recipe by Mahirah Ali at DesiRecipes.com. Marinate the chicken in all the ingredients for 5 to 6 hours. Heat oil and deep fry until goldenbrown and cooked from inside. Serve with french fries and chilli sauce. I really liked your recipes and it is wonderful. Thanks from your site. add some yogurt and do deep cuts in chicken either by knife or by pressing by fork on different sides deeply. so that the mixture will be absorbed by the chicken during marination. also make sure when frying that oil should not be extremely hot that will cook it out side but inside chicken will be not cooked. so cook it with medium heat taking a bit more time. (or u can boil the chicken with garam masala and salt before you marinate but when boiling dont use much water and let the water dries with chicken so the taste of chicken will not loose. and before marination let the chicken dry and the apply all spices and ingredients by hand and fill and rub it well with chichken. thats all.